Since the time of Alvaro Uribe Velez, where security was perceived to be improving, Colombia’s most important port, Buenaventura, has been plagued by violence from the army, drug trafficking groups, the guerrillas and the paramilitaries. Buenaventura is Colombia’s economic gate to the Pacific and to Asia. It’s strategically vital for narcotrafficking groups to move drugs, and weapons, but also for Colombian and international designs around importing foreign goods and exporting Colombian resources to the world. Buenaventura’s poverty, its invisibility and marginality are not only part of the institutionalized racism and classism of Colombian society or the armed conflict, but also an acute example of how the promise of “trade” and globalization has been empty for the people there. More needs to be explored on the confluence of drug trafficking, international trade, and structural and imposed poverty and violence in Buenaventura. Nevertheless, bonaverenses are by no means helpless. As told by VerdadAbierta.com, over 30,000 people marched last month against violence in the city. Only then did the President pay attention to the situation by visiting a few weeks ago. Check out HRW’s press release and the video below which includes testimonies from local organizers resisting the violence. This was originally published on HRW’s website on March 20, 2014. “(Bogotá) – Paramilitary successor groups have abducted and disappeared scores, and possibly hundreds, of residents of the largely Afro-Colombian port of Buenaventura, Human Rights Watch said in a report and video released today. Thousands of residents have been fleeing their homes in the city each year, making Buenaventura the municipality with the highest level of ongoing forced displacement in Colombia today. The 30-page report, “The Crisis in Buenaventura: Disappearances, Dismemberment, and Displacement in Colombia’s Main Pacific Port,” documents how many of the city’s neighborhoods are dominated by powerful criminal groups that commit widespread abuses, including abducting and dismembering people, sometimes while still alive, then dumping them in the sea. The groups maintain “chop-up houses” (casas de pique) where they slaughter victims, according to witnesses, residents, the local Catholic church, and some officials. Paramilitary successor groups emerged in Buenaventura after the deeply flawed official demobilization of right-wing paramilitary organizations a decade ago. Currently, the Urabeños and the Empresa are the main successor groups operating in the port city. The groups restrict residents’ movement – attacking people if they cross invisible borders between areas controlled by rival factions – recruit children, extort businesses, and routinely engage in horrific acts of violence against anyone who defies their will. More than 150 people who were reported to have gone missing in Buenaventura between January 2010 and December 2013 are presumed by officials to have been abducted and “disappeared,” twice as many as in any other municipality in Colombia. Interviews with authorities and residents, as well as official reports, strongly suggest that the actual number of people who have been abducted and killed by paramilitary successor groups in the city is significantly higher. One major cause of underreporting is the widespread fear of reprisals. Buenaventura residents told Human Rights Watch that they had heard people scream and plead for mercy as they were being dismembered in “chop-up houses.” In March 2014, after criminal investigators found bloodstains in two suspected “chop-up houses,” the police announced the discovery of several locations in Buenaventura where victims had been dismembered alive. In 2013, violence drove more than 19,000 people from their homes in Buenaventura, more than in any other municipality in the country, according to official numbers. Decades of violence and armed conflict have forced more than 5 million Colombians to flee their homes, giving the country the second largest population of internally displaced people in the world. Buenaventura also led all Colombian municipalities in the numbers of newly displaced people in 2011 and 2012. Displacement caused by Revolutionary Armed Forces of Colombia (FARC) guerrillas has also been a serious problem in Buenaventura’s less-populated rural areas, according to official numbers. People living in parts of the city where the paramilitary successor groups have a strong grip reported that the police presence in their neighborhoods was scarce. Several residents reported witnessing members of the police meet with the successor group in their neighborhoods. Prosecutors have opened more than 2,000 investigations into cases of “disappearances” and forced displacement in Buenaventura committed by a range of groups or individuals over the past two decades, but none has led to a conviction. No one had even been charged in 509 of the 512 investigations for which prosecutors provided Human Rights Watch information about the status of the investigation. “There is a pervasive sense of defenselessness among Buenaventura residents, who have seen how the authorities continually fail to protect them from atrocities or bring to justice those responsible,” Vivanco said. On March 6, after a regional police commander announced the discovery of several “chop-up sites” in Buenaventura, President Juan Manuel Santos said the government would intervene to address the city’s security problems. Along with increasing the presence of the security forces, President Santos promised to take measures to improve socio-economic conditions in the city. Vigorously investigate officials credibly alleged to have tolerated or colluded with paramilitary successor groups there. Bojayá: Forgotten by Urbanity, Remembered by the community. The final part of the three part series on the 11th anniversary of the massacre/Genocide of Bojayá published at Colombia Politics. Other interesting links worth checking out is this documentary on the experience of people displaced from Bellavista by the violence, this photo-report on the bellavisteños who were displaced and are trying to make a new life in Quibdó. I’d also like to again emphasize that much of my research for this post came from the Commission of Historical Memory of Colombia and their report on Bojayá, “The Massacre of Bojayá: The War Without Limits“. I would also encourage bilingual readers to check out these series of radio interviews with survivors of the genocide who are memorializing in their own words. The communities of Bojayá, in Chocó, and Afro-descendent and indigenous peoples more generally, still face serious challenges and oppressions by the Colombian state, armed actors, and multinational corporations. Chocó continues to be a FARC, ELN, and (neo-)paramilitary stronghold where groups fight over gold, land for agribusiness, drug trafficking routes, and the obedience of the population living on the rich land. It is still a central point for the conflict, and produces a disproportionate amount of displacements; most displaced chocoanos end up in Quibdó, or in Medellín where they experience the additional issue of systematic racism and discrimination against people who are rural, chocoano, or displaced. Chocó is ironically one of the richest areas of Colombia in terms of resources and since the 80s has been the apple of the eye of forestry, agribusiness, but especially mining companies. Conflict between the communities and multinationals like AngloGold Ashanti has encouraged President Santos to rethink the mining codes. Chocó also has some of Colombia´s worst indicators in terms of development. Literacy rates a relatively poor, and poverty is over 60%. In the Atrato region, 95% of the population has basic unsatisfied needs, according to government figures. All these challenges are taken on by the organizations which promote the rights of the indigenous, Afro-Colombian, and displaced populations of Chocó. These groups include the “Association of the Displaced People of the 2nd of May (ADOM)”, the “Diocesis of Quibdó” which works through the Comission for Life, Justice, and Peace, “The Regional Organization for the Emberá-Wounaan or OREWA, the “Association of the Indigenous Chiefs of Emberá, Wounaan, Katió, Chamí and Tule” or ASOREWA, and the “Major Community Council of the Integral Peasant Association of the Atrato” or COCOMACIA who have their roots in the struggles for protecting the land against large forestry companies in the 1980s. These groups do their work despite threats by armed groups. What does Bojayá mean for Colombia? We talk of Bojayá as if it were our crisis and the FARC were our terrorists who we must defeat. And although the story of Bojayá is similar to that of much of Colombia in which local communities and their ways of life are disturbed and uprooted by national dynamics – who are not interested in them but only in what their suffering can get them- we must understand that although we are all Colombian or even human, there are significant racial, class, rural/urban, and cultural divisions which means that we cannot appropriate the voice or the suffering of the people of Bojayá. The people of Bojayá have been mistreated and exploited through a process of objectification and silencing since colonization – first they were under the thumb of the colonizers, then the national government who only wishes to extract their riches or speak for their community as part of its counterinsurgency or reparations plans, and now it is menaced by armed groups and multinationals. The question is whether, when we commemorate the massacre (as we did last week), we allow the community space in which it can be heard on its own terms – or whether the urban, modern Colombia is forced to remember the other, rural (and largely ignored) Colombia only on important anniversaries, when a show can be made? “Charity…is the opium of the privileged” – Chinua Achebe, Rest In Peace. I wanted to give a quick reaction to the news that the Canadian International Development Agency, or CIDA, the body of the Federal government in charge of administering Canadian overseas development aid, is going to be folded into the Department for Foreign Affairs and International Trade (DFAIT). There have been a mix of reactions in the Canadian foreign policy Twitter and blogospheres; Director of Partnership Africa-Canada Ian Smillie says that this is a further step away from Canada’s legacy of being a leader among giving assistance to ‘poor countries’; whereas another Canadian foreign policy heavyweight, Roland Paris from the UOttawa, argues that a merger may not in and of itself be a bad thing. Surprisingly some CIDA officials are lamenting the merger, whereas Lloyd Axworthy is welcoming it. The rationale of the merger being presented by the government is to put development on “equal footing” with trade and diplomacy, and to have a more unified, consistent Canadian voice promoting Canadian ‘values and interests’ abroad. Overseas Development Assistance, or ODA, in Canada is the legacy of Liberal governments trying to create a very particular image of Canada internally and externally. One of the founding moments for ODA was the Ceylon Conference in which CIDA’s predecessor was established by Nobel laureate Lester B. Pearson. Under Liberal Prime Ministers Jean Chretien and Paul Martin, Canada’s was quite firmly committed to ODA in Sub-Saharan Africa. Canada, with it’s lack of colonial baggage and bilingual capacity/ties to the Commonwealth and La Francophonie, was always in a ‘good’ position to bolster ties with Francophone and Anglophone African countries through ODA. With the War on/of Terror and Canada’s participation in the NATO mission, Afghanistan also became a development priority. We Canadians framed ourselves as honest and disinterested brokers wanting to do what Americans couldn’t – be the benign and benevolent Westerners who wanted to promote growth, peace, and equality without any vested interests. “A confidential draft document obtained by CBC News last fall outlined the broad strokes of a foreign policy shift toward focusing Canada’s international efforts primarily on one goal: forging new trade deals and business opportunities in the rapidly expanding markets of Asia and South America. The allusion to “peacekeeping” and “democratic principles” are not an accident. Perhaps the author of this article at the supposedly objective CBC is, like Smillie and Axworthy, in my opinion, a believer in the old form of Canadian aid and it’s ties to our national identity as somehow being altruistic abroad. However, whether Liberal or Conservative, it’s quite clear that this has never been the case, and Canada’s ODA has always come with conditions, and has always been influenced or driven by the extractive sector. During Chretien’s time this was painfully obvious during the First and Second Congo Wars, and the multiple blunders of Canadian industry, DFAIT, and other actors in the DRC. In other words, many of those, like Smillie, lamenting this change as a further erosion of Canada’s legacy of “leadership” in Africa with respect to ODA, are romanticizing an era which never really was in reality, but was integral to our identity as a country of people ‘who really care’. This development ideology stands in stark contrast to the one of the Harper Conservatives. They have confidently, some would say aggressively, shifted Canada’s development interests away from “the poorest of the poor”, to use that extremely problematic language, to aligning Canadian development and diplomatic interests closer to commercial ones. The CIDA merger, I believe, is a significant moment as part of a larger pattern. CIDA, for the Conservatives, was perhaps a Liberal relic that really had no place in their vision for ODA. Throughout the last few years, this change in ideology in Canada’s ODA has manifested itself in a variety of scandals and controversies, as the Conservatives were perhaps considered to be ruining something that Liberals and progressives saw as a dear part of Canadian national life (helping poor people in far away places). Moments of note include how former Minister for International Co-Operation (the head of CIDA) Bev Oda wrote in a “NOT” for a grant to KAIROS, a well respected NGO who had been doing advocacy around the Israel-Palestine conflict, a strict no-no among new CIDA guidelines for Canadian NGOs.Under Oda, there was also a slight creeping of social conservatism into the development agenda, such as when Canada refused to fund abortions as part of a G8 Maternal Health initiative. Current Minister of International Cooperation, Julian Fantino (L), and the Minister for Foreign Affairs, John Baird (R). Current Minister Julian Fantino, for his part, drew a lot of heat for freezing assistance to Haiti, a longtime charity ‘darling’ for Canada, due to a lack of ‘results’, and for CIDA giving funds to NGOs that are associated with the anti-Queer movement in Uganda/on their webpage describe homosexuality as a kind of deviance. The most significant change, for me however, is the cozying up of Canadian commercial interests with Canadian ‘humanitarian’ and development initiatives, and the leaving of a Liberal policy of helping “the poorest” in Africa to assisting countries that we need to get resources from in Latin America. Obviously, the Liberals’ development agenda, as mentioned above, wasn’t much better, but the Conservatives is definitely more blatant in what it’s after. This has really taken shape in two key developments. Firstly, the dropping of many impoverished lower-income African nations such as the DRC from CIDA’s list of priority countries, to a slim list of 20 ‘countries of focus’ for bilateral assistance which will collectively receive 80% of Canadian aid. The list includes many extremely unequal upper/middle-income Latin American countries such as Peru, Bolivia, and Colombia. This was again, moving away from the Liberal CIDA policy of having smaller aid projects sprinkled around every corner of the earth (so everyone would know how amazing Canadians are, clearly) to consolidating development into a few key areas (of course, aligned with broader Canadian interests). Well, what exactly are those other Canadian interests? This leads to the second shift, which is probably the most telling and controversial out of all the changes – that CIDA would be subsidizing public-private-NGO partnership pilot projects in South America and Africa. In other words, CIDA would be basically disbursing aid money through the CSR branches of Canadian mining companies along with NGOs. Colombia, as usual, being one of the most unequal, poor, and violent countries in the region fit beautifully into this scheme. With the apertura economica or “economic opening” of Colombia under former President Alvaro Uribe and the beating back of the rebels from formerly marginal areas in the countryside rich in minerals/the “pacification” (read: counterinsurgency campaign) of the countryside, Colombia’s resources were ready for Canadian extraction. To make a very very long story short, Canada signed a Free Trade Agreement with Colombia, Colombia made the list of the top 20 “priority” countries for CIDA, and the largest producer of gold in Colombia is a Canadian corporation, Gran Colombia Gold, which has been accused of having ties to paramilitaries. I leave it to you to make what you will of those four things and how related or not they are to each other. CIDA has also been accused of tinkering with Colombia’s mining code, and industrializing and handing over to foreigners a gold and mining industry that has historically been run by low-income artisanal miners. The report cites reliable sources that link ten Canadian companies in Colombia to the genocide of indigenous Colombians, to complicity in eight murders and one attempted murder, to other significant military/paramilitary repression, to large-scale displacement, and to environmental destruction on a massive scale, as well as to union-busting, strike-breaking, and worker exploitation. … Never before have Canadian companies in Colombia been denounced as so destructive. They are now open to criminal charges of genocide, murder, complicity in murder, environmental damage, displacement of indigenous populations, and the violation of labour rights. So what does this CIDA merger mean for Colombia? Probably what it will mean for other countries who also have, for better or for worse, a growing Canadian presence – aid will be more explicitly in the service of the Canadian extractive sector, and all of its alleged associated abuses, and not the ‘people’, to put it bluntly. However, let’s not fool ourselves into thinking that aid was ever about ‘the people’. Until 2008, most of Canadian food aid was tied. Afghanistan was an aid priority because we invaded and occupied it. The extractive sector has had huge influence historically over Canadian interests in the Great Lakes Region of Africa. Aid has always been a political tool for furthering Canada’s political and economic interests and making us look good with respect to sensational issues such as extreme poverty and war. To romanticize the era of Liberal peacekeeping and a ‘poorest of the poor’-centred CIDA is to deny that, to a certain extent. CIDA under the Liberals was arguably just as bad as under the Tories, the question is one of representation and symbols. Under Harper, CIDA is no more because what CIDA stood for made no sense to him; aid to him should be about explicitly furthering Canadian economic/political interests. Under the Liberals, this was mostly the same except it was couched in a sinister and self-congratulating discourse of humanitarianism, benevolence, and how kind and wonderful Canadians are. However, many countries which CIDA focuses on, don’t need aid. Colombia is rich in resource and has one of the strongest economies in Latin America; however it’s rural communities exist in an almost feudal state of exploitation by mining companies, local and national oligarchs, guerrillas, neo-paramilitary groups, the army, and drug cartels. Whether it’s CIDA or the FARC, many communities in Colombia are just told about how they should be run, and never given true self-determination. What these communities and nations need, in my view, is a fundamental structural change in power relationships; that would be a discussion that really gets at the heart of poverty in somewhere like Colombia. But this has been absent from the debate about CIDA’s merger, which you would think would have something to do with poverty. The discussion is about what CIDA means to Canada. The discussion is about how some of us are not comfortable with what the Tories are doing which is being explicit about something that, actually has always been quite Canadian – making our charity all about what benefits us, and not those who we give it to. 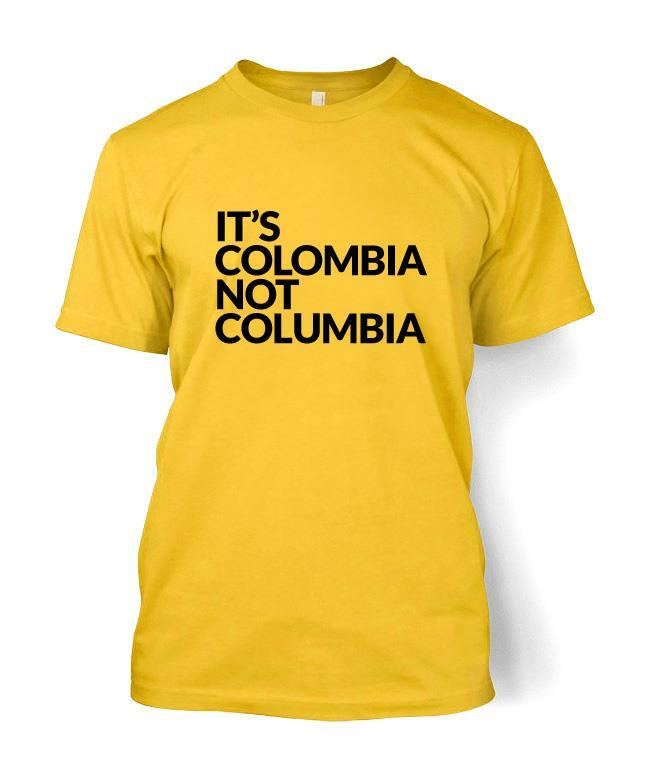 “It’s Colombia, Not Columbia” Viral Campaign – Positivity as propaganda? I recently noticed that a viral campaign called “It’s Colombia, Not Columbia”, started by a digital social media firm Zemoga and its Vice-President Carlos Pardo, has taken the Colombian community on Facebook and Twitter by storm. The campaign received a nod over at the Huffington Post, recognition by CNN, has been endorsed by ultra-famous Colombian investigative Journalist Guillermo Prieto better known as “Pirry”, and has already come out with it’s own line of T-shirts. It’s a positive development not only that our non-Colombian friends will be aware of the spelling mistake which irks all Colombians everywhere, but that young, dynamic, and social media savvy Colombians are trying to reject the negative and ignorant stereotypes that have far too-long defined the country internationally. Much of what the campaign is espousing is true – both in terms of security and poverty reduction, Colombia has made huge gains in the last 20 or so years. The heart of the campaign has an extremely noble intention – showing the “good” side of Colombia, so that we can be known for our wonderful singers, artists, writers, and people trying to build peace instead of our drug traffickers and warlords. And (painfully) slowly, Colombia is indeed overcoming it’s negative legacy. The Colombia in the late 1990s and early 2000s had over half of its people in poverty (or at least how the government measures it), that number has gone down to a third today. In 2002, the World Health Organization (WHO) considered Colombia the world’s most violent country and it was spoke of in diplomatic circles as a “failed state” in the same breath as Somalia and the DRC are today. 2012, by contrast, saw one of the lowest murder rates in almost 30 years. Also worth nothing, as Pardo himself mentions, Medellín, the 2nd largest city, went from being the murder capital of the world in 1993 to last year being voted one of the most “innovative” cities in the world. Problemas – Who gets to represent Colombia? Who is responsible for the “recovery”? However, Colombia, although a beautiful country with a resilient people and many, indeed “positive” things worth highlighting, is still a racist, violent, and extremely unequal society. Therefore, the need to be critical is manifest: What are the “positive” things that are being mentioned? What images and whose bodies are excluded? Not surprisingly,a long scroll through the campaign will only show the usual images of a “modernized” and “advanced” Colombia of mostly White and light-skinned Mestizo bodies, who are seemingly a part of the global and cosmopolitan urban middle-class, smart phones and all. Colombia’s actual population, in contrast to what many within the country would like to project, is a bit more diverse. According to some estimates by the UNDP, Colombia is up to a 1/3 rural, and according to Afro-Colombian organizations such as El Proceso de Comunidades Negras (PCN), up to 20% Afro-descendant. Colombia also has a small yet not insignificant indigenous population, which is 3-5% of the population, and a population of Arab descent in the Caribbean coast, to say nothing of other ethnic and social groups that are not a part of dominant national myths; the 35% of Colombians who live in poverty, the estimated 4.6 million who live in extreme poverty (under $2/day). Where is the place of that Colombia, Colombia in its whole, the good, the bad, and the ugly, in that campaign? Is a Colombia where we show only “positive” things also a Colombia without ethnic minorities, rural people, people living in poverty? Furthermore, this campaign is nothing new. 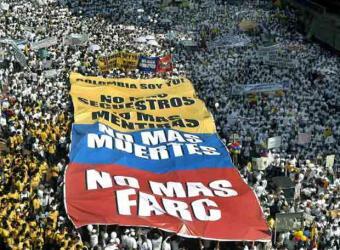 Pardo recognizes the history of previous social media campaigns trying to restore the republic’s damaged reputation, such as One Million Voices Against The FARC (Un millón de voces contra las FARC) (OMVAF). A bit of history on the movement: In 2008, Barranquillero Engineering student Oscar Morales started the OMVAF campaign – a Facebook movement that organized protests against the Marxist insurgency who has been at war with the government since 1964, the Revolutionary Armed Forces of Colombia – The People’s Army (FARC-EP), asking or an ending to kidnappings. Morales’ campaign was insanely successful with literally millions of Colombians of all walks of life out in the streets (protests in Colombia, aside from victim’s movements, are largely frowned upon by the upper and middle-classes). Morales, as documented by David Kirkpatrick’s must-read about Facebook, “The Facebook Effect”, became a key part of Mark Zuckerburg’s narrative of how Facebook’s openness can bring peace and social change to the world. What Pardo and Zuckerburg neglect, however, is that a campaign against one warlord is not a campaign for peace. OMVAF fight quite nicely into the ‘War on/of Terror’ dissident demonization discourse of former President Alvaro Uribe Vélez’s American-supported counterinsurgency campaign, in which any possible negotiation with the guerrillas was shut down in favour of a military solution to the conflict. OMVAF was also extremely useful for the state as it was silent on the crimes of the Colombian Army and the right-wing paramilitaries who have been often associated with the state’s pursuit of the guerrillas. In a similar vein, “It’s Colombia, Not Columbia” could be interpreted as basically free publicity for the Colombian government’s agenda. Within Colombia, it’s common knowledge that the government has hired a professional PR firm to create a Colombia “brand” in order to market the country as a viable option for tourism and investment, and trying to move out of the shadow of the FARC and Pablo Escobar. “There are some people who’d say that Colombia may not be the paradise that the campaign paints it out to be. For example, despite the current peace talks, violence still exists by the FARC and ELN rebel groups and Colombia remains the largest supplier of cocaine in the world. So what exactly are the changes that you want the world to see in Colombia? Again, Pardo is not necessarily wrong – Colombia can confidently claim to have one of the strongest economies in Latin America, if not the world, in this current Great Recession. What Pardo fails to mention is that, in line with the current President Juan Manuel Santos’ development plan for Colombia, natural resource extraction, not the knowledge and digital economy, will be the engine of economic growth. With economic liberalization through Free Trade Agreements, and the (largely violent) ‘re-establishment’ of the state in formerly ‘marginal’ and guerilla-controlled,yet resource-rich, rural areas thanks to the counterinsurgency, Colombia is for the last decade has become “open for business”. Indeed, during former President Uribe’s two terms, foreign direct investment in Colombia tripled. My other wonderful country, Canada, has already begun investing heavily in Colombia’s mining sector, and a Canadian bank has now taken control over one of Colombia’s most important financial institutions. Allegations of connections between the mining industry, and large agro-business and neo-paramilitary groups are countless. I also have to mention how Drummond, an American multinational, has recently been responsible for a huge fossil fuel spill off of the Caribbean coast, and the workers of Cerrejon mine, the largest open-pit coal mine in the world which is located in one of Colombia’s ‘most indigenous’ and 2nd poorest state, La Guajira, have gone on strike asking for better pay. On the other hand, poverty has been reduced by 15% in a decade, although the GINI coefficient, measuring inequality for Colombia, has barely budged from a high of o.57 to a current level of 0.55, making Colombia the most unequal country in Latin America after Haiti and Bolivia, and one of the most unequal in the world. To say the least, the foreign direct investment which this seemingly urban-produced branding campaign invites, is not without controversy. Arguably, it is taking the most, and giving the least, to those who are invisible and have been historically invisibilized in Colombian society – Indigenous people, poor people, Afro-Colombians, displaced people, and people living in the countryside or in “peripheral” regions. In conclusion, as peace with the FARC approaches, Colombians must indeed re-conceptualize what “Colombia” is (and how its want to be perceived) so that we can move past (but never forget) the nation’s hyper-violent legacy. Will we create a new social deal, recognize the crimes of the powerful, and try and move towards a new, more diverse, and inclusive Colombia which does not reproduce the systems of inequality that fed the violence in the first place? Or will we continue to sustain the same narratives and power structures in which some are heard, many are silenced, and the country’s riches are sold off to the highest bidder with little consent from the communities who live on them, but where we criticize foreigners when they dare point out our shortcomings, and even worse, misspell “Colombia”?